SKU: BIRTMAY. 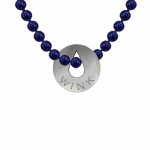 Categories: BIRTHSTONES, Bracelets, Necklaces. The ‘Birthstone’ collection are 9ct Yellow, White, Rose Gold, Black Rhodium and Silver with the relevant precious and semi-precious stones. Celebrate May birthdays with a Emerald Birthstone. 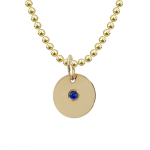 The birthstone pendant comes on a colourful brass ball chain.